Ring News 24Boxing News Breaking Boxing News Female Boxing NewsWill a Fight with Christina Hammer help Claressa Shields get the respect she feels she deserves? Will a Fight with Christina Hammer help Claressa Shields get the respect she feels she deserves? Prior to her fight against Tori Nelson this past Friday, two-time Olympic gold medalist Claressa Shields spoke to the press about what she feels is a lack of respect she has received following her early run as a professional. 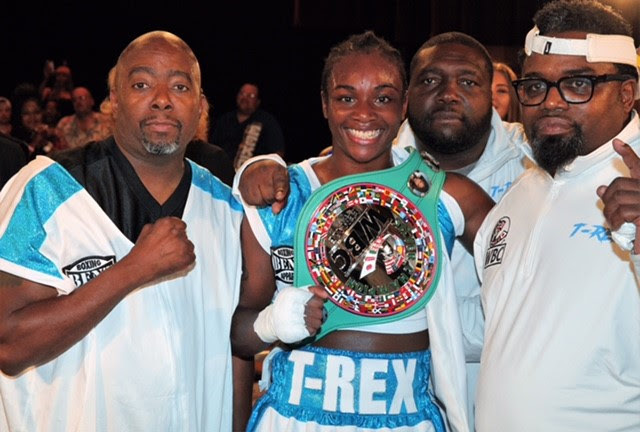 Shields managed to put her frustration to the side, however, as she dominated Nelson over ten rounds on SHOWTIME’s ShoBox: The New Generation series from the Turning Stone Resort Casino in Verona, New York. Shields dominated from the opening to closing bell, collecting 100-90 tallies on all scorecards in the first 10-round distance fight of her career. The 2012 and 2016 Olympic Gold Medalist out-landed Nelson 225-81 with her total punches, 186-70 in powers shots, and connected at a 44% with power shots compared to just 20% for Nelson. Shields is now 5-0 with two knockouts as professional in what was likely her final fight in the super middleweight class. Shields now very well could move down in weight for possible fight vs. WBC/WBO Female Middleweight champion Christina Hammer (22-0, 10 KO’s), who fights out of Germany. Hammer was ringside on Friday night and posed with Shields afterwards. “I have to drop down and see how I feel,” Shields said. “I think I could make 160 easy, I’m going to be bigger and stronger than any girl. Hammer, who very well could be in a co-featured bout on the next Shields card, was interviewed by SHOWTIME’s Steve Farhood and expressed interest in both her U.S. debut and eventually facing the American champion. “It’s a great combination me and her on the same card,” Hammer said. “I can’t wait to show the fans who Christina Hammer is. That will be the best fight ever. It will be the game-changer for female boxing. It’s our time to shine. Just a little over a year into her professional career and Shields has already made plenty of noise. Let’s wait and see what happens with her and Hammer this year.